October sunshine beamed into my hotel room as I relaxed on the little balcony. The Ionian Sea looked invitingly blue and I couldn’t wait to explore the town. I had just arrived in Gallipoli and had checked into Hotel 33 Baroni. This had had turned out to be a small, newly refurbished hotel within easy walking distance of the beaches and the four hundred year old bridge that connects the modern town to the small island which comprises the centro storico (historic centre). Four days stretched before me to be spent walking, reading, eating the local seafood and drinking wonderful Salento wines. What a task! 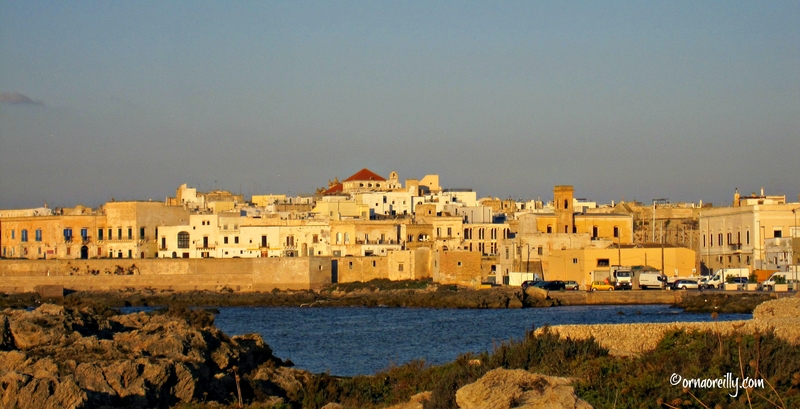 Gallipoli is on the western coast of the Salentina peninsula, in the province of Lecce in Puglia. It is in the Gulf of Taranto on the Ionian Sea. 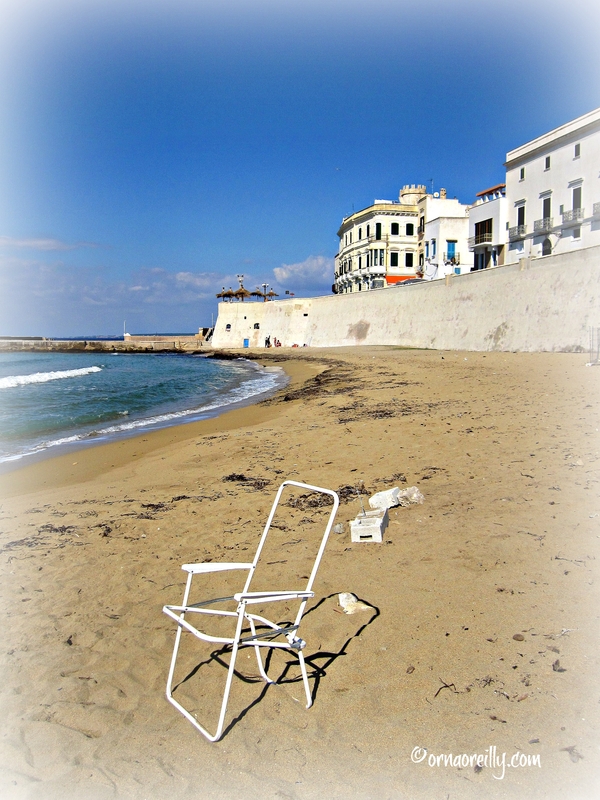 The southernmost point of the peninsula is Santa Maria di Leuca. The centro storico of Gallipoli is the city’s beating heart. As I walked across the old bridge I could see that it is dominated on the modern side by a huge building, known locally as the Glass Palace built in the 1970s, whereas on the old side, the solid fortress which has been guarding the town since the 13th century loomed over the myriad boats moored in the marina. On arrival, I was immediately embraced by a warren of ancient narrow streets. Everywhere I looked there were elegant Baroque palazzi dotted among the pretty houses. Cars are not normally allowed into this part of Gallipoli, so I was intrigued to see a tiny Ape, loaded with fruit and vegetables, being manoeuvred through the tight alleyways and a tiny Fiat Cinquecento parked beside a rack of washing. As I popped out on the far side of the island, I was greeted by a long, golden beach called Spiagga della Purità (beach of purity) fronted by a lungomare (promenade) which snaked its way right around the island. I believe this beach is very crowded in summer, but now there were just two people there soaking up the rays, while on the main beach a short walk from my hotel, I spied another yet couple of sun-worshippers. But hoards of tourists were nowhere to be seen on these glorious stretches of sand. Now only forgotten detritus was left on the deserted beach; the summer had become a mere memory. 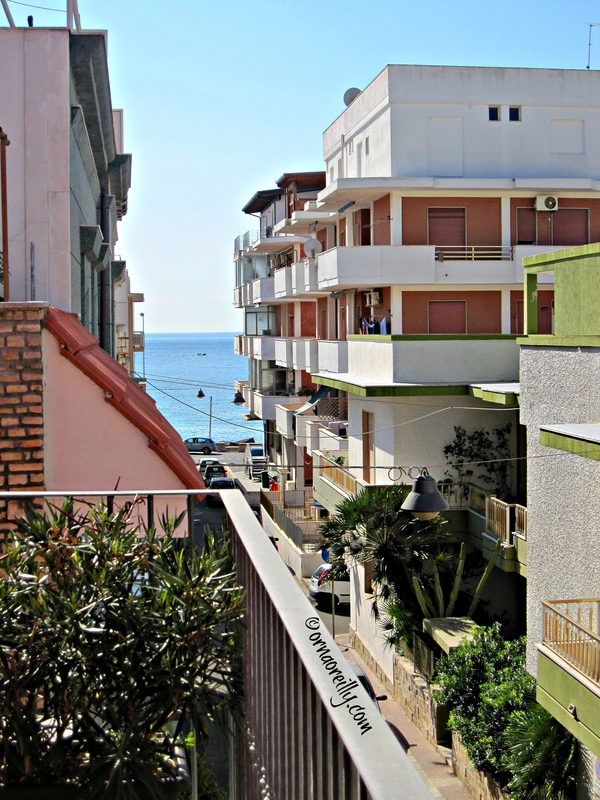 The lungomare itself is dotted with lovely little churches and is an interesting walk, which I completed many times during my visit. Gallipoli – in Greek – means beautiful city, and it is certainly that. Arriving in autumn, after the high tourist season had ended was a plus, as I had been reliably informed that Gallipoli is an extremely popular seaside location during the summer months. Now, with the beaches almost completely deserted, the children’s roundabouts and fairground rides had been covered up and abandoned until the following Easter. Strolling past those shrouded fun-fairs was, actually, slightly surreal. Every evening during my too-brief visit, I joined in la passeggiata, the wonderful Italian tradition of taking a stroll before dinner. 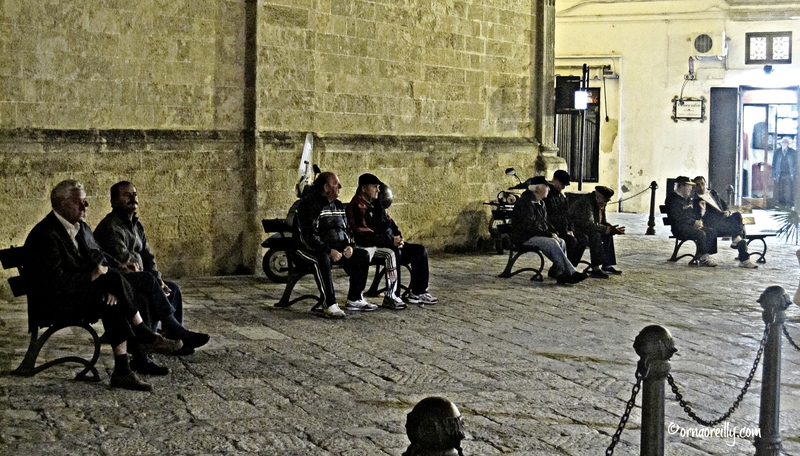 Menfolk would gather for a chat on the many benches that dotted the centro storico and watch the passing parade. I would enjoy a prosecco in one of the little bars along the lungomare and watch the sun go down, before repairing to one of the many seafood restaurants, where I dined on my favourite pesce spada grigliata (grilled swordfish). Indeed, my days in Gallipoli were positively idyllic. I loved to stroll through the fishing port and watch the fishermen mending their nets and admire the boats bobbing in the harbour. On my third lazy day in Gallipoli I decided to get out and about. I asked the hotel to organise a driver/guide to take me down to the tip of the heel of Italy. We headed off down the coast to the pretty town of Santa Maria di Leuca, where the Ionian embraces the Adriatic. We then drove up the eastern Adriatic coast, stopping in Andrano, where Chris Harrison penned Head Over Heel, my all-time favourite book about Italian travels. I look forward to returning to Gallipoli and, indeed, to the entire Salentina peninsula, as soon as I possibly can. I flew with Ryanair from London Stansted to Brindisi and hopped on a shuttle bus to Lecce, which took about an hour. I stayed in Lecce for a couple of days and was then driven to Gallipoli, which took about 45 minutes. I had been about to board the train, which takes about an hour, and walk to the hotel which was close by, but my kind hosts wouldn’t hear of it. Ryanair flies into Brindisi from the UK and many other hubs in Europe. They also fly from Dublin to Bari, which is a bit further north. Most airports in Italy have flights to Brindisi too. Nicely done O2. Now sit back and watch your readership flock to the Salento. A lovely post indeed Orna, and another spot added to my ever-growing wish-list!! Sounds like a lovely trip in a beautiful place. I must admit that prior to reading your post, my thought of Gallipoli were of the slaughter there in WWI. Glad now to have some happy thought about it! We went to Gallipoli several years ago and I took photos of some of the same buildings you did. The town looks lovely driving I to it and the beach looks good from a distance, not so great up close. I would struggle to find enough to do for 4 days there. We found it very sleepy indeed and moved on to Matera, which was much more interesting. This goes on my place to chill then 🙂 quite a few of them actually! My favourite place in the world in which to chill out. When I first visited in 1976 nobody there spoke English and in fact their Italian was often so idiosyncratic that even that sometimes was a sketchy way of communicating. Thanks for the photographs that rekindle great memories and I hope to be heading down there again in the near future. Having just visited Gallipoli, you really brought the “beating heart” of this town to life. Wonderful photos….a very transporting article, Orna.